It's exciting when a much anticipated day arrives. This video reveals the secret of Little Bear and is a HUGE hint as to what is going on with Big Bear. The cliff dwellings at Mesa Verde are amazing - no doubt about it. The ancient Puebloans thrived in these magnificent dwellings. In time, they dispersed but their heritage lives on in several Puebloan cultures today. 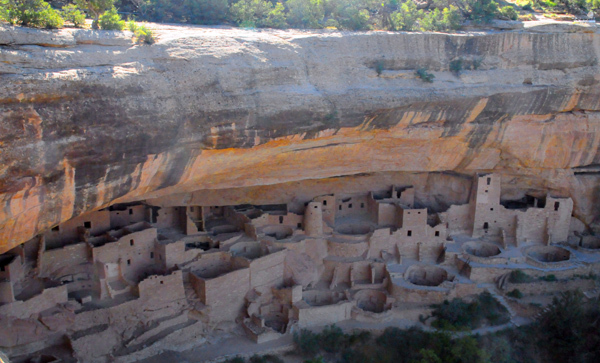 The cliff dwelling image is Cliff Palace, the largest of the dwellings in Mesa Verde. I was thrilled to be able to take this photo before tours began so I didn't have to dodge tourists in the photos. I am taking a mini-vacation with Justin, my high school friend (Bernie) and his family. We have headed west from La Veta to a destination in Colorado that is one of the most mystical and awe-inspiring national parks in America - Mesa Verde - a UNESCO World Herritage Site. The park features numerous ruins of homes and villages built by the ancient Pueblo people known as the Anasazi. The Anasazi made this stone village their home in the 1200s AD. It is best known for several spectacular cliff dwellings — structures built within caves and under outcroppings in cliffs. We will visit the park tomorrow. 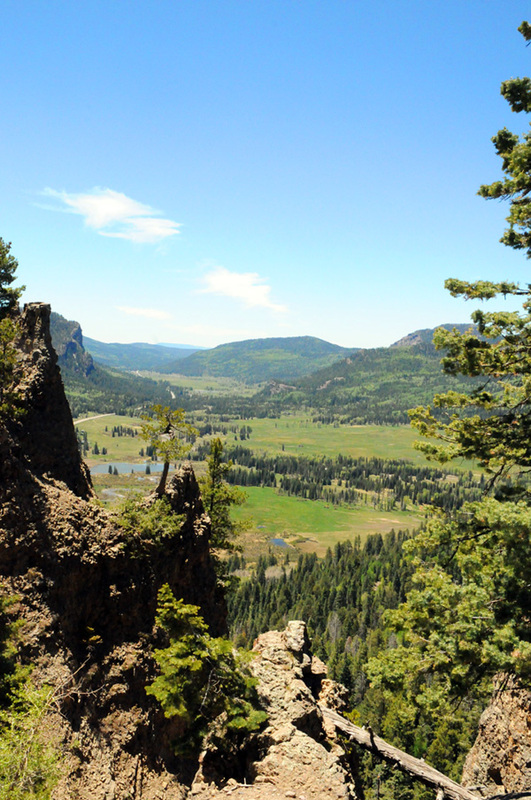 Today our journey took us over the famous Wolf Creek Pass. The photo above was taken at a scenic overlook near the top of the pass. Scenes like this is why I love Colorado!. If you have been to Mesa Verde - share your thoughts. If you have another favorite national park or place to visit (U.S. or abroad) tell us about it. Most of you know (and some may not know) that I had quadruple heart bypass surgery in April 2000 - at the age of 44. As you might expect, it was a turning point in my life and career. Shortly after that surgery (within 2 months) I had moved away from St. Louis (miss you guys) and found myself in Colorado (love it)! The stress test I took 10 years ago was a horrible experience - actually, beyond horrible. Well, of course it was awful because, as it turned out, I had two 90% blockages, an 80% and a 70%. I hope I never have to re-live that experience. After ten years I began having worries and concerns that the problem would be creeping up on me again - so it was time to bite the bullet and do the thing I dreaded most - another stress test. Without going into all the details, I'm happy to report that the doc gave me 100%, A+, nothing even minor to be concerned about. So happy dance and celebrate with me. Looks like you'll have my mug around for a few more years. 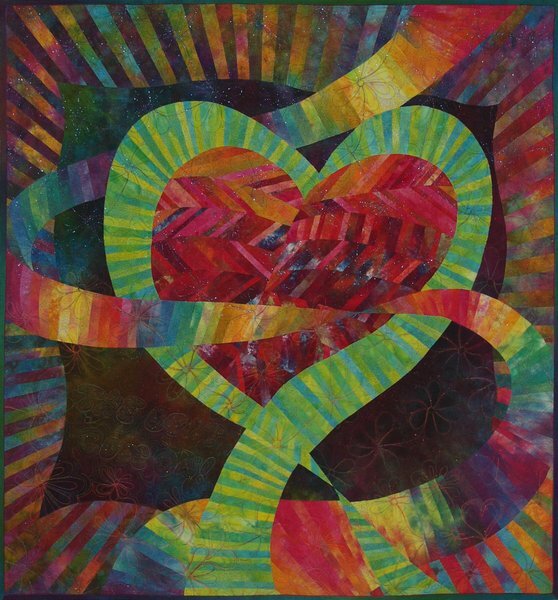 The quilt above, The Beat Goes On, was made the week following my heart bypass in 2000. Now, I think it's time to make, The Beat Goes On II. I am thankful that the beat goes on!